2 Bedrooms + 1 Convertible bed, 2 Baths, (Sleeps 4-5) Jacuzzi - 30 plus Reviews! Actually located in the small hamlet of San Sano. This is an exclusive location with about 50 residents. Don't be fooled by locations hours away! San Sano is unlike any place in the Chianti, with all of the 700 year old structures in the borgo fully renovated, you will arrive and think the entire village is a resort. Your stay will feel like you are in a resort! My apartment is also listed again by the management company. Book here directly through me for the discounts for 2018. Free Wifi is now available. San Sano will provide you a very warm and very Italian experience. You won't be disappointed. Upon your arrival in San Sano, a quiet, medieval hamlet, surrounded by vineyards and olive groves, the drive into the small village seems very familiar as you approach. That's because it was the setting for the movie, 'Stealing Beauty' with Liv Taylor. This familiar feeling will stay with you during your entire stay as you enjoy the village and interact with the most friendly of all Italians in this small hamlet. 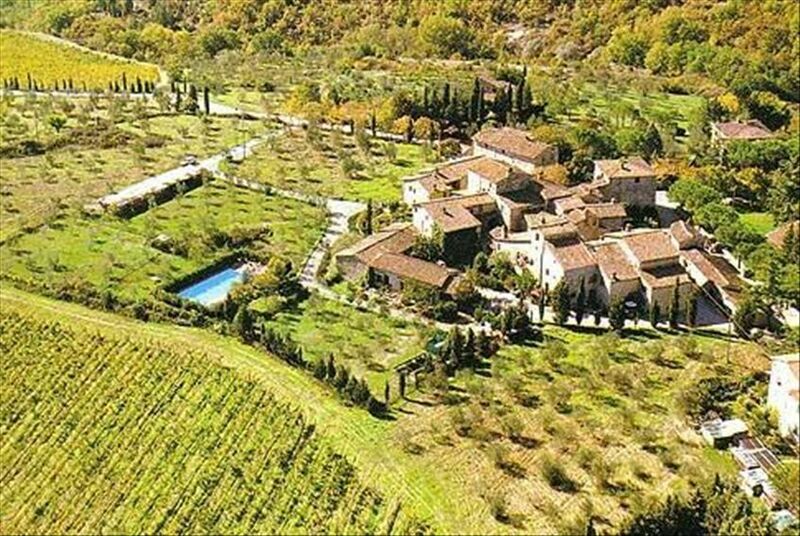 This apartment villa, unlike many others listed, is truly in the village of San Sano. San Sano is a completely, lovingly restored 700 year old hamlet of approximately 50 residences is unlike any village found in the Chianti. Here you will enjoy your days like a true Italian and spend evenings in complete silence. You will awake to the songs of local birds and enjoy the views of vineyards and olive orchards as you savor your espresso or glass of Chianti from the private balcony or outdoor garden. End your evenings grilling dinner al fresco in our private garden area tucked near our vineyard. The outdoor dining area is also a great place to sit and enjoy the view of the pool and hillsides. This lovely first floor apartment is located in the heart of the village, with views from every window across the hamlet to the vine clad hillsides beyond. It is right across the small street, just steps from the front door, to one of the best restaurants in the Chianti, Grotto della Ranna. The entrance, via a flight of steps up to the balcony, opens directly into the open plan lounge/kitchen/diner. The lounge area has two comfortable sofas arranged in front of the featured open stone fireplace. The well equipped kitchen section runs along the far wall of the room. There is also a traditional wooden dining table with six chairs. The two large windows open to the garden below and the vineyards on the opposite hills. A corridor to the right of the kitchen takes you through to the bedrooms and bathrooms. The first bedroom is on the left and has a wrought iron double bed, a wardrobe, chest of drawers and a flat screen TV. A hanging tapestry of angels overlooks you as you sleep. A large window opens up to the garden below and the vineyards on the opposite hills. Opposite the bedroom on the right of the corridor is a bathroom with double shower, basin and toilet. The second bedroom down the corridor also has a double bed with wardrobe, chest of drawers and flat screen TV. A large window opens up to the garden below and the vineyards on the opposite hills. The bathroom has a full size hydro jacuzzi massage bath, wash basin, toilet and bidet. The vineyard is seen from this bathroom window. The traditional terra cotta tile floors throughout the apartment are accented with imported, hand made area rugs. The approximately 2 feet thick original stone walls ensure privacy and quiet nights throughout your stay. The shared pool is open early May through September. The small local food market is located just steps from the front door across the small street. Because the road to San Sano ends in the village, there is very limited auto traffic and noise as San Sano is a destination, not a drive through village. You will be amazed how San Sano feels 'remote', but is just 10 minutes from Radda, Gaiole, and 20 minutes to Siena, shopping, train stations, museums, and of course, the Palio. The local hillsides are filled with vineyards, olive orchards, and small villages sporting wonderful Tuscan dishes and collectibles. Ceramics and hand made pottery shops can be found everywhere. You can site see, wine taste, relax, dine and sleep in peace. When you find San Sano, you have found 'la docle vita'. To help in your choice of accommodations, we have left our pricing at 2013 price levels so you can enjoy a high quality accommodation within your vacation budget. For those booking with us, we also offer advice on transportation, airport arrival options, itinerary planning, rental car locations, directions, and points of interest. Part of your welcome package includes many ideas for day trips as well as an invitation to dine at one of the best Restaurants in Siena owned and operated by personal friends. Don't forget to ask about any special offers as well. We can offer a full turn key package for those needing complete services as well as partial week rentals at some times during the year. Long Term vacation tenants are encouraged to inquire about pricing as well. Find us on Facebook stayinchianti. Parking is so easy, right at the front door, or in the parking spaces just a few feet away, or in our car park area a short stroll through our common garden area. If you are a couple with children and are looking for a worry free environment, then this may just be the place for you. San Sano has a small village park just across from our vineyard. There you will find swings, slides, picnic tables and play spaces - all in a safe, comfortable, and peaceful setting. Please ask if you have any questions or need further information. We look forward to sharing our piece of heaven on earth with you here in San Sano. I moved to Siena in 2005 to spend a few months taking Italian classes. The few months turned into many months with weekends spent exploring the entire Tuscan region. I wandered into San Sano one afternoon, and found one of the most amazing villages I have ever seen. A borgo was under renovation, a transformation of a 700 year old structure into something inviting. It was a re-imagination of old into new. It had my name all over. Now, I can share it with you. The village of San Sano, in the heart of the Chianti in Tuscany is one of the most beautiful villages I had ever seen. It was the location for the film, Stealing Beauty. The village, just a 20 minute drive from Siena, sits atop a hill, surrounded by vineyards and olive trees. The little village, population 60, consists of building built from the 14th thru 16th century, but all lovingly restored. It is quiet, safe, remote, yet convenient. Visitors to the village have often asked me 'Is this a private resort?'. Imagine - an entire village that seems like a resort, all at your doorstep. Our property has its own small vineyard surrounding the gardens with the pool set on the edge. It is an amazing place. First and foremost is the peace and quiet. There are few places left on earth accessible where you will find absolute quiet. It is so convenient to all Tuscany has to offer, but because it sits atop a small hill, off the beaten path, you will find it to be safe, charming and quiet. Although the buildings are over 600 years old, they have been lovingly restored with all the features that make your visit comfortable and enjoyable. The luxury queen beds, feather pillows and jacuzzi bath will ensure a restful nights sleep after a day of touring. I also have a small outdoor garden area complete with teak wood table, chairs and umbrella to dine al fresco or just sit and take in the beauty of our small vineyard and pool area. http://www.tripadvisor.com/Hotel_Review-g616196-d1227290-Reviews-San_Sano-Gaiole_in_Chianti_Tuscany.html This is a link to Trip Advisor about the village. San Sano is surrounded by olive and vine covered hills. Sometimes, in the morning, you can hear the field workers singing in Italian as they work! Excellent radiator heat makes this a desirable location year around. Wash machine located in the main living area. Uses small soap tablets found in any local store. Pack light and wash inhouse! Typical Italian clothes drying rack accommodates all your needs for drying clothes. Place close to the radiators if you are using the apartment during the winter months. You can park at the foot of the steps leading to the door for very easy unloading and loading of your car. Wi Fi now available for a small one time fee per rental if you want to use it. Open style living room with very high vaulted ceilings. Oversized windows allow for great summer breezes as well as abundant natural light. Nice convection oven for baking, grilling, broiling. Accommodates service for 8 so you don't have to constantly wash dishes. Fully equiped kitchen - brand new - with everything you need to prepare all of your meals at home. Service for 8 place settings. Set in a family style, dining is in the large room with the kitchen/living area. Child's highchair available. A variety of tourist books and light reading donated by the many guests who have stayed here. Private lawn and garden area with patio furniture. Intimate, private balcony overlooking the small village and the vine and olive tree covered hillsides surrounding San Sano. The pool is placed at the edge of our private vineyard. You can relax in privacy surround by 30 year old grape vines! Quiet hamlet of approximately 50 people, tucked in the Chianti vineyards, 700 year old restored apartment, birds, silence, views, peace. We stayed at this condo for 15 days, loved the village and surrounding area. The Condo was comfortable and in a great location. We had a few minor issues with lights in the 1st bathroom and showered in the dark for a couple days till it could be fixed, then not a problem. One other issue we had was not enough tea towels to properly do dishes. The condo has everything you need if you wish to cook which we did breakfast and a few other meals. I definitely would recommend this condo and for sure the village which is very very quite, was very sorry when we had to leave. What an incredible stay. Not just the home, or the great location or just the view from every window (amazing) but the local people we met in this small lovely town. In this central location we were a quick drive to Firenze, Sienna and many other small wonderful towns and just stay in a couple of days to enjoy the town. We hope to visit again soon and bring family. My family and I had a wonderful experience staying at Casa del Vignaiolo in the quaint hilltop town of San Sano. The house was clean and well maintained. Directly across the street was a great restaurant and small market. Our morning espresso became a daily ritual. The pool was large and a great respite from the Tuscan heat and morning runs through the local countryside. Importantly, the village had nothing in the way of a touristy vibe. We felt like residents of a local community. At the same time, however, San Sano was within easy, 1-2 hours driving distance from all the major towns in the Tuscany area. Highly recommended! If you want to experience the wonders of small village Tuscany within driving of many of the tourist draws of the area, then this is for you! Spacious two bedroom with two bathrooms and all the comforts of home. The owner was extremely helpful and friendly in letting us know what to do and where to eat and go. We has a fabulous cooking class a few Kim’s away, ate at a famous Tuscan restaurant across the street and toured ancient cities close by. The owner didn’t let us miss a thing. I know we are coming back soon! Thank you for taking the time to write a review. These reviews are important in helping guests, such as yourself, in choosing a place to stay when there are so many options. It also provides peace of mind when choosing something online. I am happy you were able to have such a wonderful experience. I try to help my guests experience some of the joys of "la vita bella" under the Tuscan sun! We really enjoyed San Sano. It’s a charming little village in Chianti. You definitely need a car if you stay here. Beautiful apartment and lovely people. We had such a great time in Chuck's apartment. Many great towns to visit. All within short drives. We will definitely stay here again! IMPORTANT NOTE: Change over day is Saturday. Short week bookings can be done as long as either check in or check out date is Saturday. The local council imposes a small tourist tax of Euro 1.50 per person per day for up to 7 days during summer season paid on site. Early booking discounts available as well. Cleaning is not included in rate quote and depends on length of stay and number of guests.